If you want to learn how to program, working with Python is an excellent way to start. This hands-on guide takes you through the language a step at a time, beginning with basic programming concepts before moving on to functions, recursion, data structures, and object-oriented design. This second edition and its supporting code have been updated for Python 3. Through exercises in each chapter, you'll try out programming concepts as you learn them. 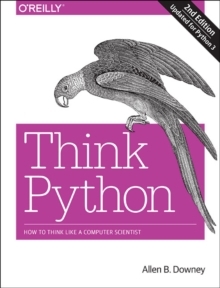 Think Python is ideal for students at the high school or college level, as well as self-learners, home-schooled students, and professionals who need to learn programming basics. Beginners just getting their feet wet will learn how to start with Python in a browser.